Ever seen one of these glowing rocks at the yoga studio, chiro office, or crystals/dragons/rainbow shop? What are they and what are there benefits? My wife has one of these that lights up her meditation space. Well, the following is an article sent to me by Eddie Gilani who explains all of it. Himalayan salt lamps are incredibly popular nowadays; it seems like shops peddling these lamps are everywhere now, and there are no signs of this trend slowing down. Some people buy them because they’re a cute novelty item to decorate their homes with. But Himalayan salt lamps are more than just an attractive accessory, they can also help improve your mind, body, and soul. 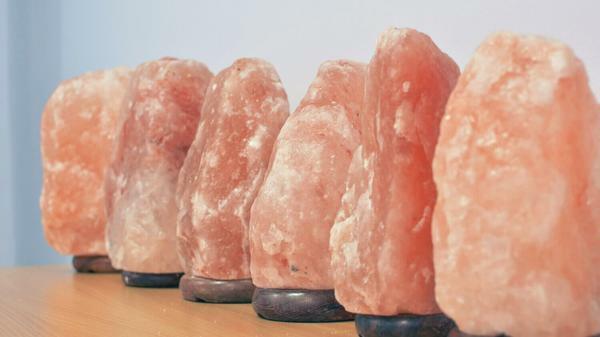 What are Himalayan salt lamps and how do they work? As the name implies, these lamps are made out of salt from the Himalayan mountainside. They can come in pretty much any color, but the most common ones are usually pink or orange. After they are mined, the salt is formed into a huge chunk which is then hollowed out to fit a light bulb inside. Ancient civilizations were known to use salt therapy to soothe minor ailments and increase mood and energy levels. Extensive research has been done on salt therapy and whether or not it does any of the things it’s been claimed to do..
Himalayan salt lamps are known to contain the same 84 natural elements and minerals found in the human body. These lamps store vibrational energy, also called negative ions, which have a host of health benefits when released. They can also purify and detoxify your room by getting rid of nasty toxins and contaminants in the air. Himalayan salt lamps are 100% safe for humans, but you should take care to keep it out of reach of small children and pets. Nothing interrupts a yoga session more effectively than a fit of sneezing. Himalayan salt lamps naturally remove dust, bacteria, and germs from the air, allowing you to take deep breaths of pure, clean air. Negative ions, which are also found in nature, is proven to increase energy levels, promote better oxygen flow to the brain, and leave you feeling refreshed and relaxed. You could get your dose of negative ions from going out in nature, but that’s not always feasible; a Himalayan salt lamp will deliver similar results without any of the hassles. You need your body to be in tip-top shape if you want to pull off more difficult poses. Himalayan salt lamps help to reduce inflammation in your muscles, preventing cramps and allowing for a full range of movement. It can also help soothe migraines, headaches, and other respiratory complaints. Sometimes your mind can’t help but wander during yoga practice, even though you know it’s important to stay focused if you want to get the full range of physical, mental, emotional, and spiritual benefits. The negative ions in Himalayan salt lamps help to counter the positively-charged electromagnetic field we are exposed to every day, which can cause poor focus, stress, frustration, fatigue, and depression. Aren’t Himalayan salt lamps incredible? Use one in your practice today and feel the difference.